It's been a bit over a month since I last ticked off a letter in the Alphabet Challenge Revisited. 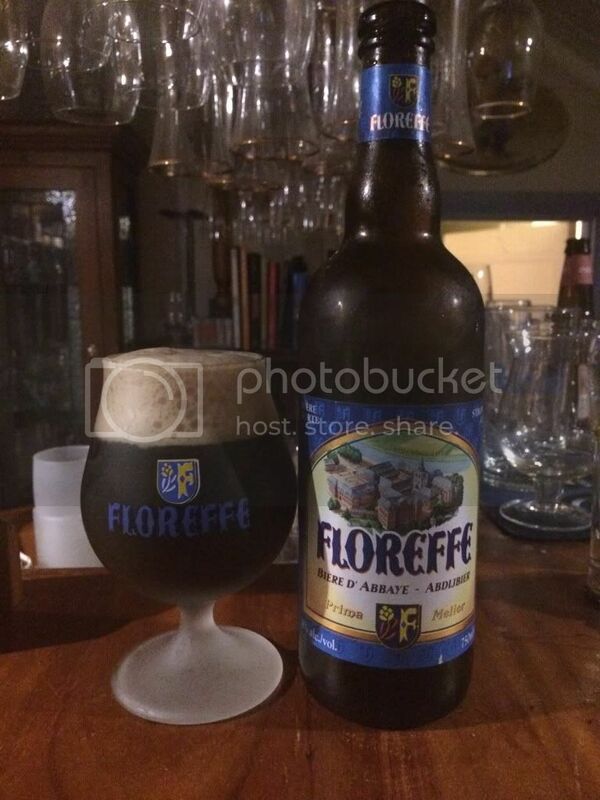 Here today we have one of the first Belgian ales that I ever had, Floreffe Prima Melior. Lefebvre Brewery makes it and has been operating at the site of the Floreffe Abbey since 1876 and brews beers based on the abbeys traditions. Last time: "This is a strong Belgian (not Southern) ale, which is particularly dark. It has a very thick and full bodied flavour, which is strangely caramelly in texture. The distinct aftertaste is inherently tangy. This beer sounds strange and is really strange. It's worth a try solely because of how different it is." Hopefully my palate and writing has improved a little since then! (What was that??) Let's crack into it then and put that to the test! Frosted glassware can sometimes hinder seeing the appearance of the beer, however this Floreffe one is different. When the liquid hits the glass instantly the frosting fades and you can see the dark brown liquid quite clearly, reddish orange highlights included. The head is a tan/khaki colour with a number of quite large bubbles. Despite this the head had good retention, more than just a film left upon completion, although the lacing was minimal. Much like the nose there is a distinct lack of Belgian yeast when tasting Floreffe Prima Melior. The overall feel of the beer is sweet with the sugars taken centre stage initially. Dark fruits begin to have more of an effect as the beer warms, while the spices; particularly cinnamon and nutmeg, become quite significant. This beer gets better and better as it warms, it's definitely one I'd sit with for a long time. The carbonation is a little high which may upset some people. At least in my mind this is a much more succinct review than my last effort. In summation; Floreffe Prima Melior is a good, but not exceptional, example of a Belgian Strong Dark Ale. It doesn't have the Belgian funk that many people associate with the style, but the dark fruits that come across are exceptional. This would be a good starter Belgian Strong Dark Ale, but not a great beer for Belgian connoisseurs.